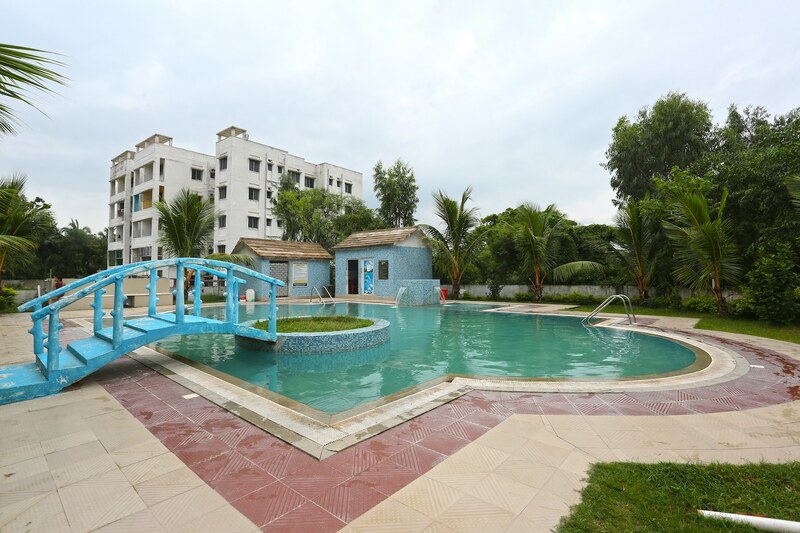 Amantran Resort is a charming property with outdoor pool and lush green lawn, located on NH 116B, Ghersai, in Digha. It is close to Jagadishpur Bus Stop, Alankarpur Bus Stop and Digha Flag Railway Station. Casuarina Forest, Sri Gouranga Mandir, Sankarpur Champa River Estuary and Maa Kali Fish Centre are close by. Amantran Resort has a large outdoor swimming pool and a lush green lawn for the relaxation of guests. There is a cosily furnished banquet hall as well. The rooms here are big, done up in bright colours and feature lovely wallpapers. They have multiple windows offering refreshing views of the surrounding greenery. Bathrooms are clean and neatly tiled too. All the rooms of this resort are equipped with an air conditioner and a television, and the bathrooms have geysers. The hotel offers power backup, free Wi-Fi, parking facility, and CCTV security. You can make your payment through cards. There is also an elevator on the premises. Some of the food joints near the resort are Wow Momo!, Hotel Artland, Hotel Sonar Bangla, and Pabitra Hotel & Restaurant.